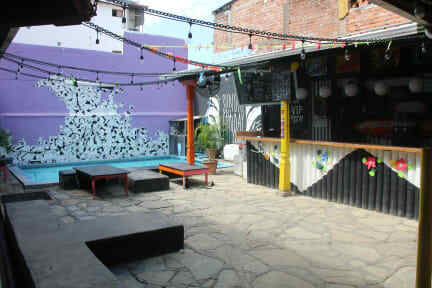 Hostel Pachamama is one of San Juan Del Sur’s oldest party hostels in town and also the coolest place to stay at! We are located just half a block away from the beach and amazing sunsets. Comes completely with refreshing pool, a spacious outdoor area, a kitchen for you to use at any time and a bar for some drinks in the evening. Come stay with us and join the Pacha Family! We are located in San Juan del Sur, one of the best areas of Nicaragua. Some of the finest attractions of the city such as Cristo de La Misericordia, the Hike to the Faro, Museo Cultural Sn. Juan del Sur are all right around the corner. We're also more than keen to show you the awesome beaches around our little town. If you wanna go for a surf, just chill, see turtles or end your beach day with a barbecue, we're more than happy to take you there and can organize a shuttle at any time. Most important for us is, YOU get to have a GOOD time! Pachamama is a must stay along the backpacker trail and will make you feel like family. See you soon! Check in from 08:30 to 22:00 . Check out from 08:30 to 11:00 . This property might charge a deposit on your credit card. Bar on site opened Tuesday - Sunday. HAPPY HOUR 6 - 9 pm.